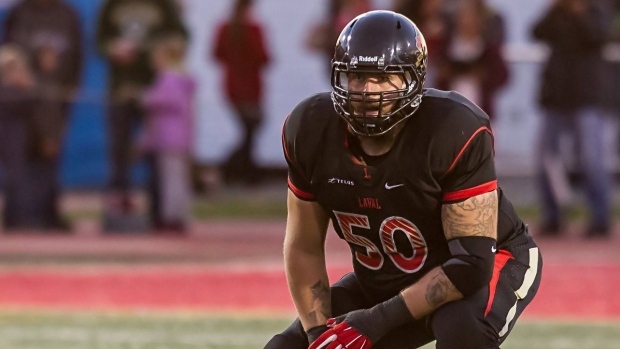 For 6-foot-6, 325-pound Laval offensive lineman Danny Groulx there are certain aspects to the game of football that he likes, and the physicality is definitely one of them. While not politically correct to say in 2015, football’s appeal for many remains the contact and the degree of violence that is inherent in the sport. Groulx started playing football in high school in Sherbrooke and due to his size was encouraged to be aggressive. He’s never looked back. Groulx took the mentality of a defender playing on offence. This attitude got noticed and was envied by opposing coaches. Groulx originally played hockey but soon realized he didn’t have the skills to be a professional. His family signed him up for football and he knew after his first practice that football was a game at which he could excel. His toughness and his work ethic stood out and would eventually get him noticed. He eventually ended up with Glen Constantin at Laval. Constantin encouraged Groulx’s attitude as he wanted all his offensive linemen to be aggressive. With Laval, Groulx would go on to win two National Championships (2012 and 2013). He didn’t receive any All-Star or All-Canadian awards during his time at Laval, but his size and style of play helped him stand out. He knows he will need to bring more than size as a pro. Groulx just completed a five-week camp at Compass Athletics in Atlanta to prepare for an NFL Regional Combine in Baltimore at the end of February. He believes he has the potential to make it to the NFL and with the likes of former RSEQ lineman like Laurent Duvernay-Tardif and David Foucault making it onto NFL rosters last season, the idea is not far-fetched. His agent Jonathan Hardaway often has his clients exhaust any and all NFL options before coming to the CFL. Despite this, Groulx expects to be at the CFL Combine this March and plans to give teams the same message when he talks to them. While CFL teams will like what they see and hear from Groulx, the degree of interest from NFL teams is sure to impact where he gets taken in the 2015 CFL Draft. Our next player profile will be on the No. 9 prospect in the 2015 CFL Draft, Addison Richards, receiver from the University of Regina.